A California music shop accountant has been fired after she berated an elderly Jewish man wearing a “Make America Great Again” hat inside a Palo Alto Starbucks this week. Rebecca Parker Mankey detailed the encounter on Facebook and Twitter on Monday, posting photos of the 74-year-old President Trump supporter and labeling him a “hater of brown people,” the Palo Alto Weekly reported. Ms. Mankey said she yelled at the man and tried — unsuccessfully — to get other Starbucks customers to join in on her tirade. She said she berated the man all the way to his car and then vowed to give him “nowhere to hide,” the Weekly reported. “I am going to publicly shame him in town and try to get him fired and kicked out of every club he is in,” Ms. Mankey wrote, according to a screenshot posted by a woman named Amy with the Twitter handle @RightHookUSA, who vowed to inform Ms. Mankey’s husband’s employers of her behavior. Click on the graphic to enlarge photos and text. According to the Weekly, Ms. Mankey also wrote that she told the man to call the police so that she could learn his name and where he lived, his wife’s name and where his children went to school. She has since deactivated her social media accounts, The Blaze reported. 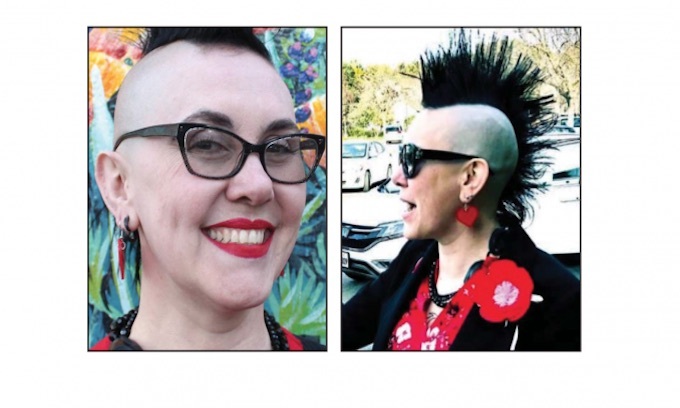 Ms. Mankey told the Weekly that the posts have resulted in violent threats against herself and her now-former employer, Gryphon Stringed Instruments, where she worked as an accountant for the past four years. Gryphon manager Matt Lynch told the Weekly that the company’s Yelp page had taken a serious hit since Monday. Meanwhile, the 74-year-old Palo Alto man, whose name has not been reported, confirmed to the Weekly that Ms. Mankey’s description of the encounter was truthful. “What’s happened around here is that people get the idea that if you’re for Trump you are an evil person,” he lamented. Trump Derangement Syndrome (TDS) is a mental condition in which a person has been driven effectively insane due to their hate of Donald Trump, to the point they will abandon all logic and reason. Symptoms for this condition can be very diverse, ranging from racist or xenophobic outbursts to a complete disconnection from reality. This is a very common disorder inflecting the majority of the deranged Liberal Democrats. Not only do they hate President Donald Trump, they hate anyone or anything that supports our President. These people literally must have the IQ of an infant. Their actions are completely juvenile. Please don’t disparage infants and juveniles by comparing them to these insane imbeciles. Most infants, DON’T know what they are doing is wrong. HE IS AN ADULT, who damn well SHOULD know better though.. So he’s WORSE than an infant. These creatures do not even come up to the intelligence of an infant they are not intelligent enough nor do they have the brain power, they are more like a bacterium, a single cell organism that can be gotten rid of by spraying it with some agent orange hahahaha. Creatures like the one depicted in the article just are not worth the time or the trouble. Squash them under foot and move along. And they don’t even know why they hate him – that is the idiocy of the situation. They are told, directed by the Dem Party to hate him. Sheeple. i would have smacked her right in her filthy mouth. And then saught out cops, to charge IT with a crime.. Surely wanting to harass and call on your kids to be harmed should be one.. I would have used a wet glove on the things mouth busting its jaw in several places so that it could never open its mouth again. Scruffy, you stated that they abandon all logic and reason. Logic and Reason are two things that democrats are always short on. That’s why they are leftists. This is your typical liberal democrat today. Maxine Waters is the face of this type of behavior. They have embraced the ideology of the 1930’s germany brown shirts and are pretty darn close to becoming the Gestapo. It would be nice if this somehow was a surprise to anybody. However, every single story now simply is met with an, “of course,” rather than any surprise. Again, this is what the democrats have embraced. Don’t forget, once Hitler came to power he disarmed the civilian population, or at least those who were not in the Nazi Party. This is why I call them DEMONcrats because they are demons just look how they act and treat others, they are an abomination to the country their actions are just plain evil. This idiot, brain dead 40 something punk rock wanna be got exactly what she deserved. FIRED and sent home. No doubt a worthless pseudo intellectual from some safe space university who never learned that actions and words come with pay back…….even if you live on the West Coast. IT needs to be reported for harassment and terrorist threats; but then the police probably would side with it. She needs Jesus, as does every one of these Leftists spewing hate and wanting to control everybody’s lives. I agree… but even Jesus can’t help someone who refuses to believe, insist’s that God doesn’t exist and that they themselves are at the center of the universe …. I feel sorry for them. I have taken to wearing a MAGA hat just to aggravate people like her. I am considering purchasing a small ink pad, and a snowflake stamp. For every snowflake I get a response from, I will stamp a snowflake on my MAGA hat. When I get 10 stamps, I will be an Ace, just like the WWII fighter pilots. Schippt…………..you’ll need a vest to have enough space for all those stamps! I’d be tempted to give the SNOWFLAKES a piece of paper with that stamp on! Some people just need a smack in the mouth to bring them to their senses or at least make them aware of their lack of sense, although that would’ve been a lesser punishment than getting fired for making an embarrassing spectacle of herself. However, her firing was completely justified. She earned it. and letting the harassers employer know what kind of threatening behavior they exhibited is totally appropriate, particularly since God alone knows what that individual would do if they found out that one of their co-workers was actually sympathetic to Trump. Big liability risk. God forbid one of her co-workers were injured or worse when she was acting out, because bottom line, that’s actually what it is. Taq. ITS BECAUSE we’ve not stood up for ourselves, for so long, turned the other cheek so to speak, THAT THE LEFT HAS BECOME THIS bad.. They’ve not been put in their place. I’m even more concerned about the so called husband and his position in society. What a big mouth, Unhinged Lunatic! Despicable!!! The oh so tolerant left strikes again. They’re tolerant of everything they personally believe in. She should be charged with harassment. I hope this man files a police report. If this is a prime example of “the left” today, Trump should win re-election easily. Take THAT, “Chief”! Doxxing is worse than normal harassment. People have died because of doxxing. We need new laws to reflect this. She’s NOT a typical Democrat. I’m left leaning, but I would have come the older man’s defense in that situation. I’m glad she’s been fired from her job and publicly shamed. This is the kind of stupid stuff that gets all liberals tarred with the epithet of “Snowflakes” and “Libtards”. Come on, people, be smarter than that. Try discussing the issues for a change. Baloney. Search this site for Maga hat and you will see many stories about how violent and triggered you folks can get at the site of a red hat with MAGA on it. Search the Internet and you will see many more. It’s a big world, with the internet full of everything. Search “neo Nazi violence” for a seamy look at the other side of the fence. As one of “you people”, I’ve seen plenty of MAGA hats, Trump t-shirts, and pro-Trump bumper stickers. I didn’t need a safe place to hide, nor did I attack any owners of these items. Occasionally I’ll talk politics with them if we’re in a social setting. I enjoy discussing my objections to some of his policies with Trump supporters. They are almost always respectful, at least, the intelligent ones are. Nearly all Trump supporters are always respectful. That elderly Jewish Trump supporter was respectful too. He just sat there and let the evil Democrat make a fool of herself. The 2020 Democrat candidates have come out against Jews, Israel, pre-born babies, God, capitalism, caucasians, men, especially white men, and America. Flip it over. The Democrat Party stands for Islam, death, Satan, socialism, racism, #MeToo, pussyhats and anyplace with an autocratic form of government. Trump supporters are supporters because they are intelligent enough to know that his policies are good for America. Arguing against those policies is not a sign of intelligence. Search Antifa and take a look at what the left has spawned. We could do this all day but talking to a Democrat is a total waste of time. Catch a unicorn to utopia. It’s a long trip. Better get started. Since 2016, this certainly has been the left’s go to tactic..
You are quite mistaken. This is now the norm. I see these people daily at the university and at my children’s high school. They are the most intolerant, hateful, bigoted, violent people in existence. THe one who drove that car into the crowd, James Alex Fields, being he was, a Supposed proud nazi, AND NAZIS ARE SOCIALISTS (national socialist workers party), was far from being a right winger.. As for roof, again he was a nazi/member of the KKK (or wanna be). Who founded and up till the late 70s led the KKK?? OH YEA< the democrats. So that is NOT PROOF 'we right wingers" are more violent"..
then lets look at all the mass shootings.. How many of them have been done by REGISTERED DEMOCRATS!? A hell of a lot. Bless your heart, quietguy. But you are not a typical Democrat any longer. That party is over. It took Jimmy Peanut for me to see the light. Just as the Republican party has been overrun with Republicans In Name Only, your party has been supplanted with socialists who don’t hold to your ideal. So you are in effect not being represented by your party. Why are you on the GOP website if you are “left-leaning”? To troll? Every single regular user on here is a supporter of GOP and President Trump. You are just wasting your time trying to incite with your ridiculous “Nazi” examples. What a charming, lovely young woman. Yeah, the haters are on the right, sure. Sounds like delusional “beckypankymanky” is going to meet her comeuppance, real fast! Maybe she will learn to “hold her tongue”?? Probably not- – it will be “some mean person’s fault” and she did “nothing wrong” – -only in her sick brain. Quiteguy; I wore a MAGA hat to a poker tournament with about 60 people there. I was personally confronted by three different people on how sorry Trump was, etc, etc. Although not physically accosted (my size may have something to do with that), they were definitely trying to intimidate me into not wearing it! I don’t think this article is an anomaly at all! Heck, just look on this site alone, for how many times people wearing maga hats got assaulted. I actually had to reread this article several times because I just could not believe a man had married this thing. What kind of self-emasculating person hates themselves to the point they would marry this? I am guessing the terms “husband” and “wife” are of fluid definition here. If the wife looks like a bespectacled rooster what can the mate look like? Attractive to whom?? a blind drunk? You mean she actually has a husband? Poor guy. Maybe he has an affliction – blind . She really is a piece of work. Bless that Jewish man that had to put up with such trash. She got her moment in the sun now she’s happy. The thing I wonder about is what kind of parents she has to bring up a person like that. SAD!! She probably doesn’t believe in God but whether she does or not she needs to thank Him that it wasn’t me she confronted. Depending on how much she got in my face she’d have wound up with either a broken jaw or a broken neck. Either way I’d have shut her big mouth once and for all. I wear a MAGA hat every day, I’m 72 and all I ever get are complements. A couple of weeks ago on the way home after a gun show I stopped at a LOVES truck stop for a sandwich. The scrawny girl cashier behind the counter pointed at the TRUMP button on my jacket and said “We don’t like that button”. I said “Say what”, and she repeated it, “We don’t like that button”. To which I replied, Ain’t it great to live in America, the land of the FREE and the home of the brave, Where you don’t have to wear this button and I don’t have to give a sheite what you think. GO TRUMP!!! BUILD THE WALL, DEPORT THEM ALL, MAGA, OR ELSE!!! And just who has been feeding her the propaganda that supporting Trump is racist? The Democrat party is all out of ideas because they have abandoned working for the nation and just want to stay in power by any means possible. Clearly, Rebecca Parker Mankey wishes that she could have lived and been part of “the movement” from 1941-1945 so that she could gas anyone who is wearing a MAGA hat — or who might just be of Jewish origin. Ms. Mankey, hoow ’bout you go live in some far away land, a long was from the United States of America. You have NO American blood – you are ALL-NAZI. Mankey wants to drop the pellets into the shower heads. The face of your typical looney lib.